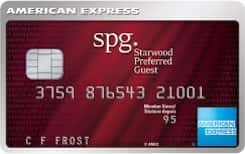 Earn 5 points for every dollar in eligible Card purchases at participating SPG®* and Marriott Rewards®* properties. Earn 2 points for every $1 in all other Card purchases. Receive an Annual Free Night Award at eligible hotels and resorts worldwide every anniversary. No annual fee on Supplementary Cards. Redeem points for free nights with no blackout dates at over 6,500 of the world's most desired hotels. Automatic Silver Elite status membership. Enjoy an automatic upgrade to Starwood Gold Elite status when you reach $30,000 in purchases on the Card each year. American Express is not responsible for maintaining or monitoring the accuracy of information on this website. For full details and current product information click the Apply now link. Conditions apply. This CAD currency 79 is issued by American Express and runs on the American Express Network. The purchase interest rate for this credit card is: 19.99 percent annually and the transfer balance interest rate is: % per year. Also the cash advance rate is: 22.99% per year. Travel cancelation is Not available for this credit card and also travel accidents are Included. © InterestRates.ca. 2019 All rights reserved.